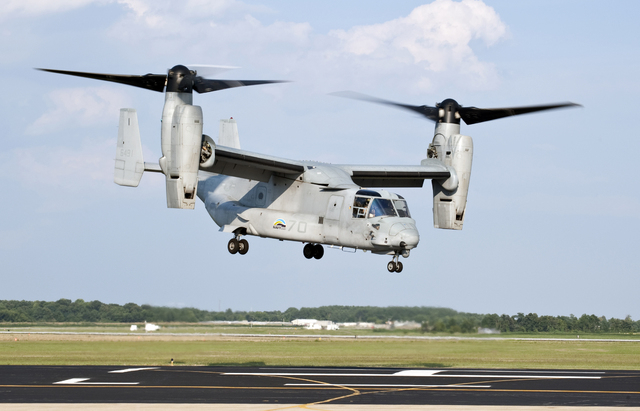 A Marine Osprey tilt-rotor aircraft made a hard landing Monday near Creech Air Force Base during a routine training operation, Air Force and Marine officials said Monday. 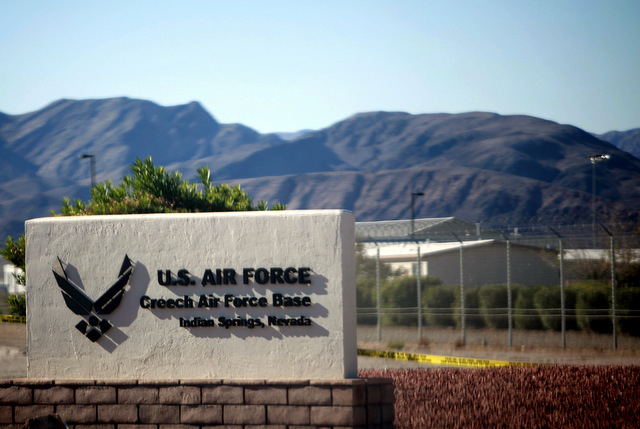 JESSICA EBELHAR/LAS VEGAS REVIEW-JOURNAL The entrance to Creech Air Force Base in Indian Springs, Nev., is seen on Oct. 20, 2011. No injuries were reported during the 3:38 p.m. incident involving the MV-22 Osprey assigned to the 3rd Marine Aircraft Wing at Marine Corps Air Station Miramar near San Diego. “There were four crew members and all four walked away from the aircraft,” said Marine Capt. Anton Semelroth, a spokesman for the 3rd Marine Aircraft Wing. A map from Clark County fire officials indicates the Osprey landed on public land about 3 miles northwest of the base along U.S. Highway 95 near Indian Springs, about 48 miles northwest of Las Vegas. Base officials, however, had not confirmed the hard-landing location at 7:15 p.m.
Semelroth said the crew experienced the hard landing during a routine training exercise that was being conducted in conjunction with training at the Creech base, a hub for remotely piloted aircraft operations. Unmanned drones such as MQ-1 and RQ-1 Predators and MQ-9 Reapers are typically flown from the base via satellite links, controlled remotely by pilots and sensor operators sitting at computer consoles inside ground stations at Creech. MV-22 Ospreys can make vertical takeoffs and landings but their twin turboprops can be shifted into horizontal positions so the aircraft can fly like a fixed-wing plane. Semelroth said no damage estimate was available for the Osprey involved in Monday’s hard landing. In 2008, the MV-22 was priced at $67 million per aircraft.